At WSU you will be mentored by faculty, motivated by high-achieving peers, and supported by Cougs around the world. You can mix and match your major(s) and minor(s) from more than 200 academic fields of study, many of which are nationally ranked. You’ll find students, faculty, and alumni united by one common thread: Washington State University. No matter who you are or where you’re from, once you’re a Coug, you will have a network of supporters. They’ll help you land your first job and open career doors. Choose from more than 200 fields of study at WSU—many of which have been honored nationally or internationally for excellence. 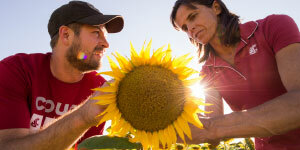 Programs in Communication, Organic Agriculture, Veterinary Medicine, and Business are just a few top-rated examples. Hands-on research. Our students are encouraged to get involved in academic research and scholarship activities, regardless of major. Study abroad. Many WSU students travel abroad to study, conduct research, and participate in faculty-led trips. We provide more than 500 opportunities that span the globe, ranging from Australia to France, from China to Costa Rica. Honors College. Our Honors College offers an enriched liberal arts curriculum with an international focus. You can major in any field, complete the honors curriculum, and still graduate in four years. Boeing, Hilton Worldwide, Microsoft, Nordstrom, Deloitte, Insight Global, Energy Northwest, Marriott, Google, NBC, Enterprise Holdings. These are just a few of the big names. WSU students also go on to work for a wide variety of community organizations and small businesses—and also start their own. Top writing program. In 2018, WSU’s writing program ranks among the top in the nation by U.S. News & World Report. WSU has been included on this list every year for well over a decade. The program helps students in all majors develop their writing skills. Top educator of state’s nurses. The Bachelor’s of Science in Nursing (BSN) program is ranked first in the state by number of graduates. Regardless of your hometown, background, and interests, you’ll feel welcome here. We offer a diverse, supportive learning community that will deepen your awareness of the world and help you build long-lasting friendships. is a University-wide residential community-learning program for new students. The program connects students to our community and its resources and jump-starts their opportunities to interact with peers. Once students join the WSU community, it’s not long before they discover Cougar Spirit and learn how it defines our community. 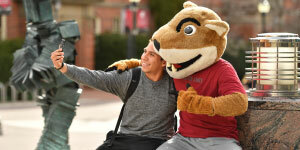 Equal parts intellect and emotion, Cougar Spirit is personified by a confident, can-do attitude and an enthusiastic willingness to join other Cougars to solve a challenge or help out a friend. The alumni connection. Cougar alumni are fiercely loyal to their alma mater. One way they demonstrate that commitment is by opening career doors to fellow Cougs. The WSU Alumni Association regularly schedules social activities regionally, nationally, and internationally to keep Cougar Spirit strong. Pac-12 sports. Pac-12 athletic competition brings world-class athletes to campus throughout the year to compete in sports ranging from football to women’s soccer. 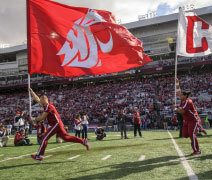 Join the thousands of crimson-clad fans who transform each home football game into a daylong celebration of Cougar Pride! The Pullman campus is home to 20 residence halls featuring a variety of amenities, building features, and areas of focus. Whether you’re looking for a hall that groups students by academic field, gender, or even interest in leadership development, we’ve got you covered. Sustainable living. Three newly built residence halls and recent remodels of existing halls were completed to minimize environmental impact and meet sustainability goals. The projects incorporate recycled building materials, use less water, rely on natural light to conserve energy, and are constructed from regionally sourced materials whenever possible. Greek life. An active Greek community has been an important tradition here for more than 100 years. About 25% of the student body participates in 40+ chapters of national sororities and fraternities. Our Greeks engage in more community service hours per academic year than any other campus organization. Enticing eats. Three campus dining centers offer a wide selection of entrées and extras throughout the day and into the night. Menu choices range from pizza to a variety of international cuisine and vegetarian items. We feature locally grown ingredients purchased from regional farmers who incorporate sustainable agriculture practices. Campus living room. Most students spend some time at the Compton Union Building several days a week. Here they take advantage of a variety of student services in one convenient campus location, including a food court, bookstore, coffeehouses, gaming stations, banks, post office, copy center, phone-charging stations, and plenty of comfortable seating. Park that car. The University encourages students to use sustainable forms of transportation. Among those available: Pullman Transit (free for students), WSU’s green bike system, and Zimride, a convenient way to share a ride to an out-of-town destination. Pullman is a dynamic center of higher education, research, and culture nestled among the beautiful rolling hills of the Palouse, a geographic area covering some 10,000 square miles in southeastern Washington and north central Idaho. The community is located close to world-class outdoor recreation opportunities, including bicycling, hiking, skiing (water and snow), camping, golfing, and boating. A lively campus and community. Big enough to host stars like Macklemore and Ryan Lewis, Florida Georgia Line, and Gabriel Iglesias. Small enough to walk from campus to downtown with friends to enjoy a latte or sample the newest pizzeria. That’s Pullman in a nutshell: a classic college town offering year-round tastes of big-city flavors. Music, theater, film, and dance. From instrumental and vocal performances presented by WSU’s School of Music to a vibrant community scene, entertainment choices abound. Among the don’t-miss opportunities: Popular performers like Colbie Caillat, Brett Eldridge, and Taylor Swift. Free movies in the Student Union every weekend. Live musical performances at downtown establishments. Concerts presented by the Washington Idaho Symphony. And much more. Intramurals. Participating in intramural sports is an exciting part of the Coug experience. Each year more than 6,000 individuals participate in 80+ intramural activities, including team sports like co-ed basketball and flag football and individual activities like indoor triathlons, tennis, and golf. Student recreation center. Students can take advantage of more than 200 pieces of cardio and weight equipment; seven courts for basketball, volleyball, and badminton; a 31-foot-high climbing wall; a five-lane lap pool; an elevated four-lane running/walking track; and much more. Outdoors. You’re more likely to need sunscreen than an umbrella when you head for an outdoor adventure here. With 172 sunny days and only about 21 inches of rain a year, the Palouse provides comfortable weather conditions most of the year for activities ranging from hiking and bicycling to rafting and disc golf. And when it snows—usually about 28 inches each year—there are ample opportunities for snowboarding, skiing, and building snowmen. We award about $390 million each year to students in the form of scholarships, grants, work-study, and loans. Aid is offered based on financial need, academic achievements, and available funds. We welcome students transferring from other colleges to WSU. We offer special academic advising and other student services, as well as transfer orientation sessions. More than 1,000 transfer students from across the country enroll here each fall. The typical student is 22 years old and has completed 55 semester credits. Among transfer students’ popular academic interests: engineering, business, and communication. Transfer students interested in attending WSU should review our Transfer Credit Equivalency website (transfercredit.wsu.edu) to understand how classes will transfer from their current institution and to identify the courses required to complete a major. Visit our website to learn more about academics, campus life, and other aspects of the WSU experience. Next, schedule a visit to WSU in person to see this amazing university for yourself. We offer a number of special, full-day visit events throughout the year as well as campus tours weekdays and Saturday mornings throughout the year: visit.wsu.edu.